This is my father-in-law, Robert L. Rice. 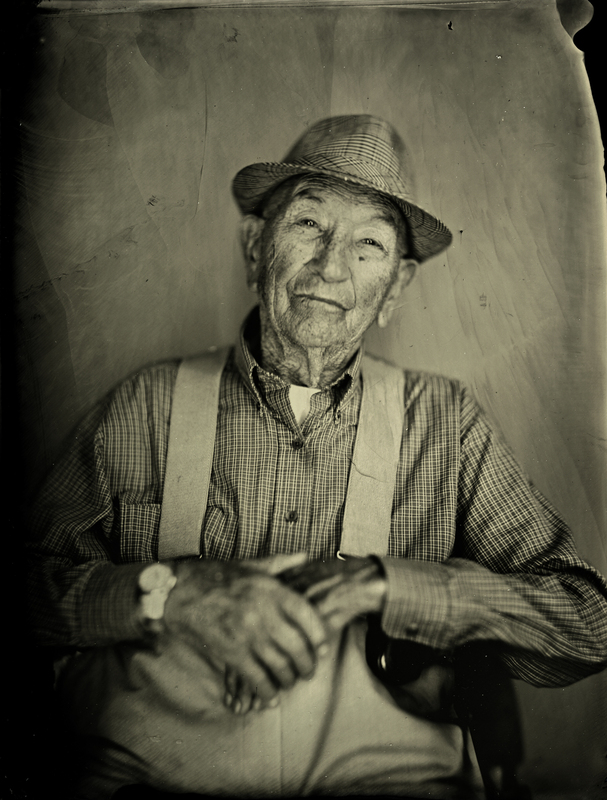 He is 96 years old and was at the studio this week, along one of his sisters and his bother to have tintypes made. It was such a joy to make images of them together, but I especially liked this individual portrait of him. He is old school. He never wears anything but long pants and a long sleeve button down shirt with suspenders, regardless of how hot the weather is, and he will not leave the house without his trademark hat. To put things in perspective, when my father-in-law was born in February 1918, World War I had not ended, and the Wright brothers had only pioneered flight 15 years before. Mr. Rice has seen a lot of change in the world. Tintype Portrait of a Young Girl – one of the art lovers from the neighborhood near Taylors Mill, and a regular visitor to my studio. 19th century wet plate collodion process. 10 sec. exposure under 12 6500K UV tubes. Image taken with an original 1872 brass barrel Ross portrait lens (f/4). 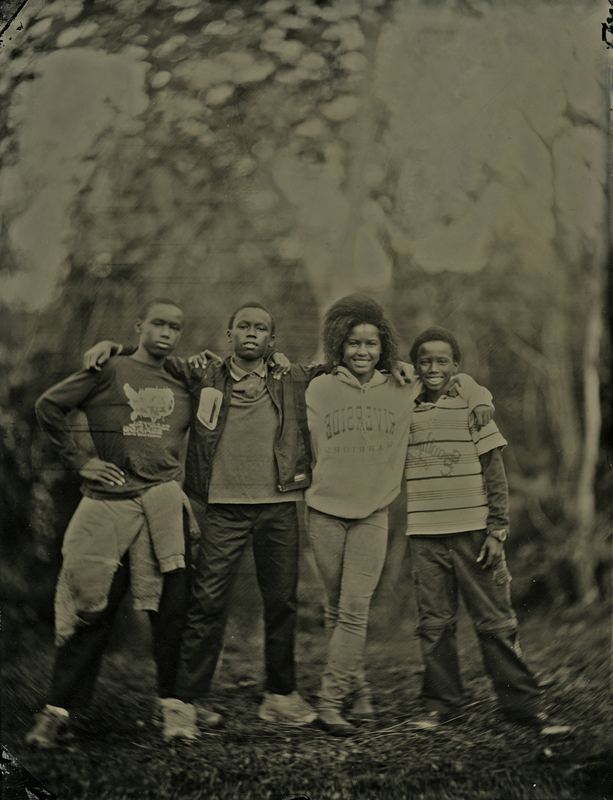 This is a tintype portrait of three brothers and their sister, who live in the neighborhood near my studio at Taylors Mill in South Carolina. Since opening my studio there in 2012, I’ve gotten to know these great kids, who are very interested in my wet plate collodion process. They’re regular visitors on the First Friday art crawl and also stop by to talk whenever they see me working. I’d wanted to make a portrait of them for some time, and I got my chance this week. 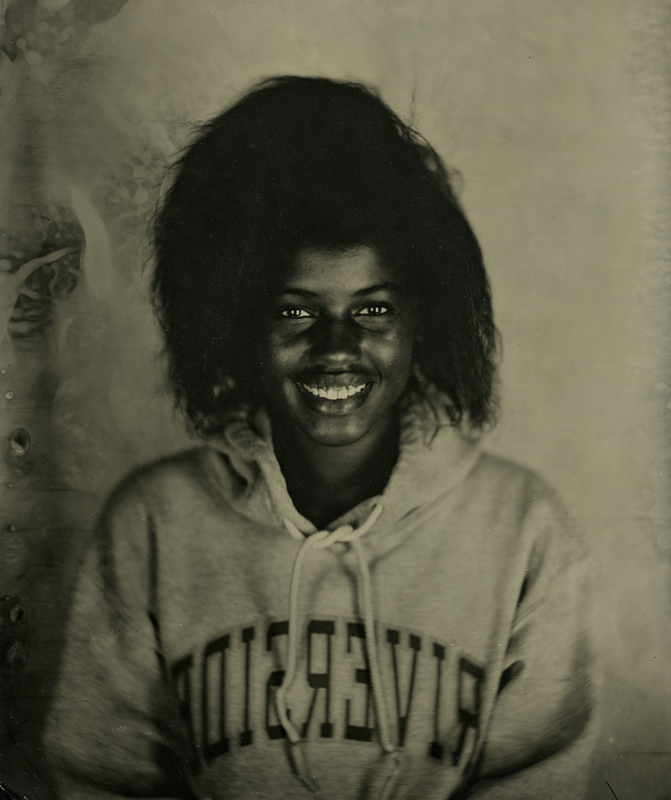 This image also appears in the 2014 World Wet Plate Collodion Day gallery – hosted by Quinn Jacobson. That gallery honors Frederick Scott Archer, who invented the collodion process in 1851. Every year on his birthday, collodion photographers around the world make images to celebrate. 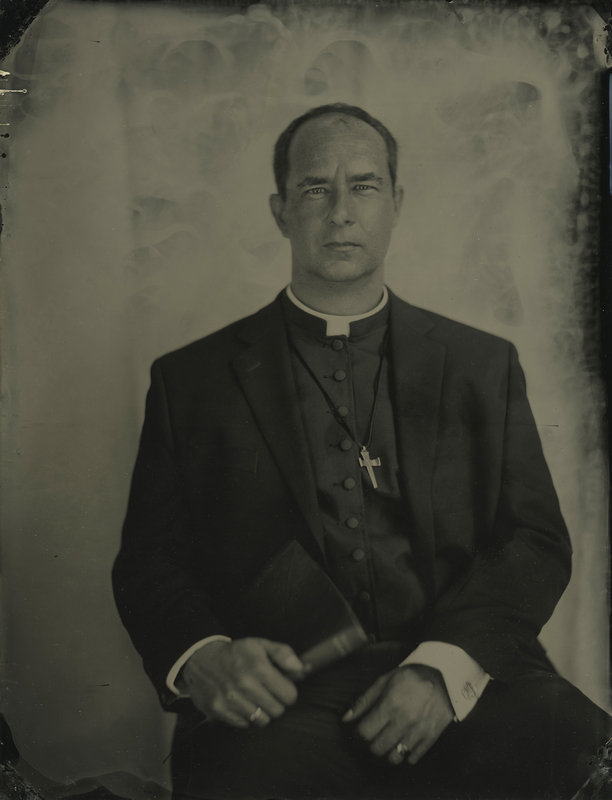 Tintype portrait of Rev. Keith Turbeville taken recently in my studio at Taylors Mill. Keith is an Episcopal priest, who just completed his tenure as an associate minister at Christ Church Episcopal in Greenville, SC. He and his family are moving to Texas, and he will become rector of a new church, Holy Trinity by the Lake in Rockwall (near Dallas). This image was made using the 19th century wet plate collodion process, which was invented in 1851 and replaced Daguerreotypes as the most popular means of studio photography. Wet plate collodion was the primary means of making photographs through the 1880s. For this tintype, I used a reproduction 19th century wooden box camera with bellows and an original brass barrel Ross lens made in London in 1872. The exposure time was 4 seconds under two arrays of 6500K UV lights.